Kids love toys, and that is a fact. But bringing out fresh ideas for toys is not exactly easy for parents. A good opportunity to offer your kids another type of toys to play with is Easter time. You can use this excellent occasion to have the kids learn something about these special celebrations while offering them someone new to play with. There are many fantastic toys to discover, and some of them may make your kids fall in love with them so much that they will not want to part ways with them. What was first? The chicken or the egg? This particular Easter-themed toy seems to have the exact answer to this question. 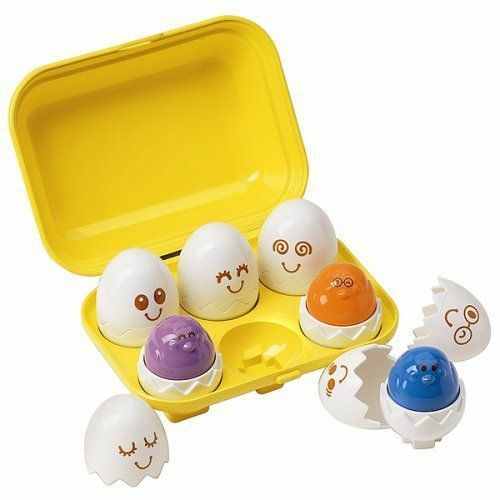 The set comes with six eggs, but do not be fooled by the appearance that may make you think that they are just ordinary eggs. These hatch and shells crack to let you see six beautiful and brightly colored chicks. What better way to teach your kids about such a thing than a fun toy like this one? The mechanism is simple; you just have to press on each chick’s head to hear it chirping. Your kids will surely have fun with these. If your kid loves cuddly toys, this one will surely be to their liking. 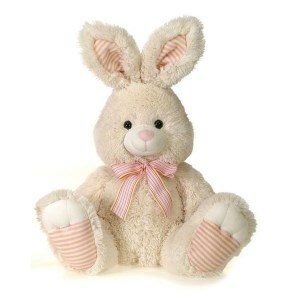 The bunny is made from plush materials that do not pose any threat to kids who are three years old or older. 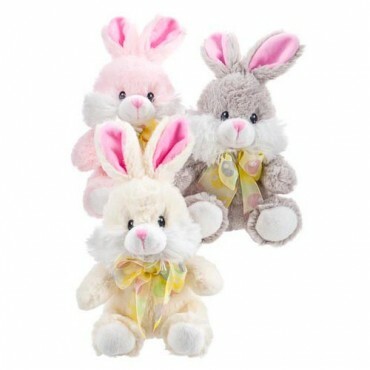 Your little one will love this bunny so much that they will carry it with them all over the place. If you are thinking about creating a beautiful Easter basket, you should consider getting one of these, too. The delicate pink bow makes this fluffy bunny even cuter. As far as maintenance goes, this one only needs to have the surface washed and air dried, to avoid damage. Kids love toys that teach them how to do different things, which is why the Prextex Jumbo may be just the right thing to offer them as a gift this Easter. The clay dough in the package can be split, and molded to fit the patterns provided. The dinosaur-shaped molds are fun, and the kids will love how easy it is to create these extinct creatures using nothing but their hands and the supplied dough. 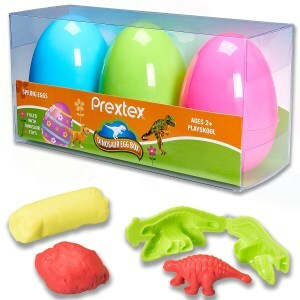 The package comes with three large eggs that contain the needed clay dough for making colorful dinosaurs. The 3D molds are also included so that your kid can start playing right away. LEGO has many fans among the young and not only. It is no surprise that they also offer a special package just for Easter, as a lot of children will want this version to play with. The game will put you on an Easter egg hunt, which can be quite fun and entertaining. The package comes with a henhouse, and the henhouse has an opening door. As you can easily imagine, you can use this to hide the egg inside and have your kids search for it. 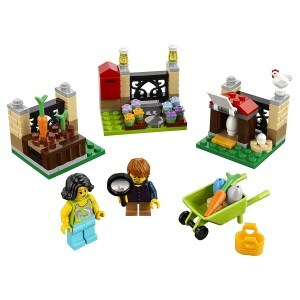 The package includes 145 pieces, and two miniature figures, representing a kid and a grownup, to complete the picture. Some toys teach kids that chicken eggs hatch to reveal chicks, while others can make things even more fun. 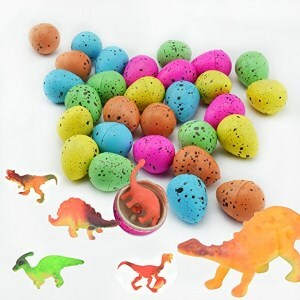 This particular toy includes dinosaur eggs that will hatch into small dinosaurs, much to your little ones’ delight. However, there are some important qualities to this toy that must be mentioned. For starters, it helps kids learn what patience is. The eggs must be left in the water, and hatch in 2 days’ time. Imagine your kids’ surprise and delight when they will see what this toy can do. The toy contains only natural rubber, so it is entirely safe for your kids. Teach your kids about what the Easter represents and how important is to have your family close, by gifting them this beautiful book. 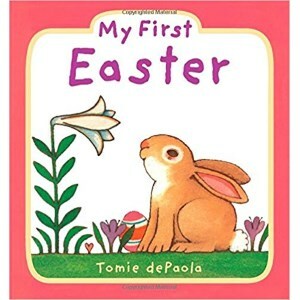 Your children will be able to identify various Easter symbols, by carefully looking at the fantastic illustrations inside this book, created by Tomi dePaola, one of the most acclaimed authors and illustrators of children’s books. All the texts that accompany the pictures are easy to understand, and they do not go deep into theological explanations that might just confuse and bore the kids. This Easter, you can make your kids well acquainted with what Easter means in the funniest way possible. One of the most commercial worldwide holidays, besides Christmas, is Easter. Easter is not only linked to a highly religious episode in the Christian belief, but it has been marketed over the years to appeal to all persons, whether or not they are Christian practitioners. It stands to reason that one of the most notorious links to Easter remains the story of the Easter Bunny, an imaginary creature which, alongside Tooth Fairy and Santa brings presents to kids around the world if they behaved well. Thus, it comes as no surprise that over the years children become anxious around Easter time because they can hardly wait for the big white fluffy animal to come bearing gifts and red Easter eggs. But, although this is certainly an exciting moment for children, parents may seem a little bit overwhelmed by the demand of searching and finding the most suitable presents for the little ones. If you too have a toddler at home who can hardly wait for the Easter Bunny to pay him a visit, we came up with a fun and comprehensive shopping guide to help you ease the process. Here you will find not only a useful buying guide but also tips on one of the coolest toys for children today. Being a parent doesn’t come cheap, especially since there are literally countless options on the toy market. From educational audio books and toys to imagination stimulating boarding games or overly cute plush toys, we are sure you will find a hard time picking up just one or two toys from our list below. Here is how we can help you. Never go toy shopping without a pre-established budget on your mind or else you will risk cashing out all your checks and go into serious debts. We mean it! Parents are the most irrational consumers and buyers as they always put the children’s needs above everything else and they would even sacrifice the last penny to make their kids happy. Thus, no matter the occasion – Easter, Thanksgiving, birthday, name day or Christmas, it is always advisable to have a preset amount of money you are willing to spend on toys. If you take your time and search the market a few weeks prior to a holiday, you will find lower prices on the same products. Another way to make the most out of your money is to wait until the last minute to grab some cool deals and discounts. However, we don’t necessarily advise you to do this because if your kid wants a very popular toy, you may end up staying long hours in the lines to have yours or may not find it at all at the end of the day. It’s always good to keep an eye on certified online retailers and resellers as their websites often include special offers and discounts. We live in an era where kids can easily get multitalented and develop numerous skills from an early age. The access to all the world’s information could be put to use through some educational toys which are not only fun to play with but will also help your child develop his imagination and cognitive processes. We suggest you look for educational toys such as books or board games. Little children can easily develop their artistic skills through a drawing game with preset figures. All you have to do is let your child draw an animal and then guess their final result. It is a fun way to spend quality time with your toddlers, away from tech devices. Storybooks and audiobooks also make suitable presents for Easter, especially if they are packed with fun stories about chickens, hens, rabbits, or even Humpty Dumpty. And speaking of eggs and the story of Humpty Dumpty, you cannot have an Easter without the famous Easter egg hunt. Why not make it more fun this year and, instead of regular eggs, choose surprise chocolate eggs. The most notorious and, at the same time infamous, chocolate eggs are the ones produced by Kinder. Dozens of generations throughout the world spent their childhood collecting the toys hidden inside these delicious chocolate eggs, and we are sure your child will not beg to differ either. 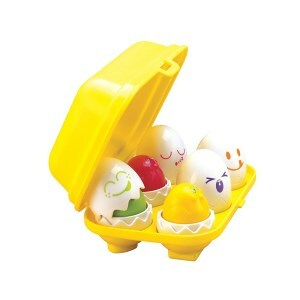 If you’re not fond of the Kinder products, there are other types of surprise eggs on the market containing small toys. However, we do suggest avoiding contact with these little toys if your child is less than three years old. Please take into consideration the warnings on all toys and games destined for children and provide your kids with toys suitable for their own group age. By far the most popular choice when it comes to children of all ages is the famous plush toy. There are countless designs on the market to choose from, but you should pick a special one for the occasion. The adorable Sylvain is already an extremely popular rabbit amongst children of all ages, because of its sweet design and soft fabrics used to create it. Sylvain comes in numerous sizes ranging from miniature to 50 cm long, meaning there is a perfect size for every child. What we genuinely love about this product is that you can buy an entirely new wardrobe for it and dress it up as you please. The toy is especially suitable for little girls who love playing with clothes, but literally for everyone who wants to try their styling capacities. Sylvain will really love being dressed by you or your kid, so regularly make sure to buy new clothes according to the season outside. Another cute plush toy you can buy for your kid comes in the form of a cute pink rabbit named Rosie, which comes with her own hutch to hide in when she doesn’t want to come out and play or when she needs to go to sleep at night.